The name description in the program is for those who entered by July 10. Please be sure to buy travel insurance before the application for the event. Male or Female over 18 years old with the ability to complete the marathon within 6 hours 30 minutes. Time: 1:00 p.m. ～　5:00 p.m.
※Transaction fee will be required separately. Including the online registration of 200 positions for overseas entrants. Number card voucher will be upload on JTB Sports Station entrant's "My Page" by early September. The notification mail will be sent to entrant's registered email address. Time:1:00 p.m. ～ 5:00 p.m. Handmade Finishers Medal which was made at Abashiri Prison. * The medal is made of Japanese Pagoda Tree. 1. Runner must follow the specified running road for safety. 2. Entries are non cancelable/ nonrefundable. 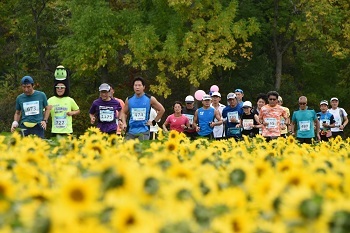 In an earthquake, storm/flood damage, snowfall, accidents, epidemic disease, or any other reasons, the organizers will assess the situation and make a decision concerning scaling down/cancelling the race accordingly. 3. Parking space is limited. Please come along with the companions. 4. Organiser cannot accept any responsibility for any loss, damage or accident at the parking. 5. Valuable items and personal belongings must take care by own responsibility. The organisers cannot accept any responsibility for any loss or damage to your personal belongings. 6. Please make every effort to ensure your physical condition before participating, e.g. by carrying out through training and undergoing a medical check. 7. Should any emergency, such as an accident or fire, occur during the race, emergency vehicles may pass through at any point on the course. In such cases, runners are asked to follow instructions from event staff and may be requested to stop temporarily. 8. The runner who will were the costume for the race, please be sure the below items and follow them. 1. A costume which is dangerous to other runners. 2. A costume which might obstruct to other runners. 3. A costume which is judged not to suitable for the race by the organizer. * If it is corresponded the above items, the entry will might be cancelled. And, the entry fee will not be refund. 1. Race time will be measured using timekeeping chips. Gross race time (measured from the start gun) and Net Time (measured from the start line) will be measured and finishers certificate will be issued after the race on the day. 2. Number Card will be provided by organizer. 3. Time checkpoints will be set throughout the marathon, based on transport safety, security, and our operations and logistics requirements. Entrants who arrive at the checkpoint after the designated closing time will not be able to continue the race. Notoro Point　14.4　11:05 2hr, 20min. Lake Side Park　29 13:10 4hr, 25min. Cycling Road Entrance　35 14:05　5hr, 20min. 4. 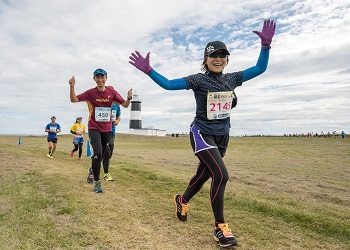 The Okhotsk Abashiri Marathon will be held in accordance with the provisions of this marathon and the 2018 JAAF competition rules. *Please be sure to read and agree the following conditions before applying the marathon. 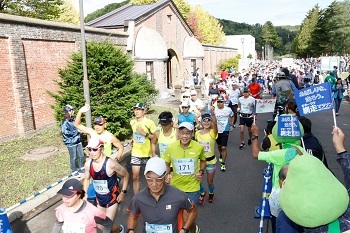 Should any such acts be discovered, the entry/ award in question will be cancelled, entry fees and charges will not be refunded, and future applications for the Okhotsk Abashiri Marathon 2017 will not be accepted. 12. For event-related matters not covered above, please follow the instructions of the organizers. 13.In addition to the above-mentioned application agreement, it conforms to convention regulations separately specified by the organizer.